08.05.16 :: Categories: Boat Blog and Crude Oil Transport. In June, the U.S. Coast Guard announced that it was soliciting comments and concerns from the public on a proposal to establish a large number of anchorage grounds for commercial vessels in the Hudson River – 43 berths in 10 locations from Yonkers to Kingston – at the request of industry. This action, which caught many communities off guard, was taken at the behest of several commercial organizations: the Maritime Association of the Port of NY/NJ Tug and Barge Committee, the Hudson River Port Pilot’s Association, and the American Waterways Operators. When the Coast Guard receives such requests, they’re required to respond, substantively. In order to more fully inform its internal review, the Coast Guard is accepting comments from the public through December 6, 2016. Essentially, the Coast Guard is taking the temperature of the communities along the Hudson while also asking the barge and boat industries for clarifications to their initial proposal, which would open up over 2,400 acres to new anchorages. There are currently just two official anchorage grounds, at Yonkers and Hyde Park. Additional anchorages are proposed for: Kingston Flats South, Port Ewen, Big Rock Point, Milton, Roseton, Marlboro, Newburgh, Tompkins Cove, Montrose Point, and Yonkers. Last month, Riverkeeper, in partnership with the Pace Law School Environmental Clinic, and alongside communities, advocacy groups, and citizens, called for public hearings on these plans. Until the Coast Guard decides whether to propose these new anchorage grounds, we won’t know whether our call for public hearings will be accepted or rejected. Sign up for Riverkeeper’s action alerts to stay informed. The open comment period is the Coast Guard’s attempt to determine what, if anything, it should consider if it decides to ultimately propose these anchorage grounds. Your voice is needed to protect the river. 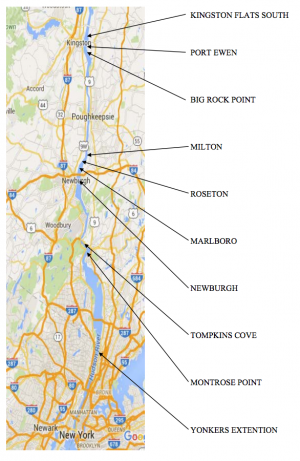 These anchorages could permanently affect the Hudson as we know it. Leaders from cities, towns, counties, and statewide offices are voicing a wide range of concerns; that barges will affect waterfront tourism, present hazards to public safety and boating, and pose new and unmitigated oil spill risks. Many localities along the Hudson have long-term waterfront goals, coastal revitalization policies, or park and historic preservation plans that would be negatively affected if these anchorages are made official. All these concerns are valid, but Riverkeeper’s environmental concerns so far generally fall into three categories. 1. Re-industrialization of the Hudson Valley – and specifically, the threat presented by crude oil to the river and our communities. This request by industry is only part of an emerging trend which threatens to dramatically increase industrial activity in the Hudson Valley. 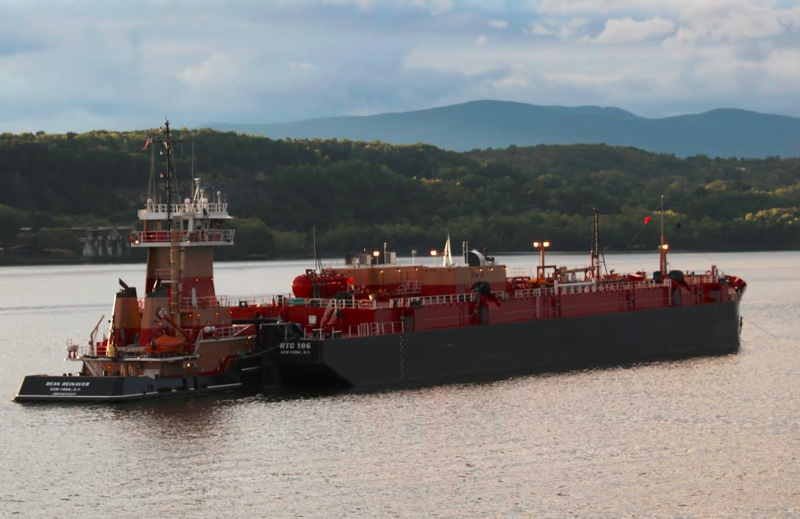 Several projects are in the works to expand the Port of Albany and the Port of Coeymans, for example, and increase the carrying capacity of the crude oil rail line from Buffalo down the Mohawk and Hudson valleys. And the Global oil terminal in Albany is fighting to gain permission to heat Alberta tar sands crude for transport down the Hudson. If we look at just this anchorage proposal, we’re only looking at part of the story. If we look at just the proposed expansion of the Port of Albany, we’re only looking at part of the story. To protect the Hudson and ourselves, we need to know the whole story – and how the various pieces of it may leverage others. Not all commercial cargoes are equally dangerous to the Hudson. If we were only talking about the movement of crushed stone, for example, there would be much less urgency. The cargo of greatest risk to the Hudson is petroleum. For decades and decades, refined petroleum products like gasoline, heating oil and diesel have traveled north to the Port of Albany. But starting in 2012, crude oil produced in North Dakota began arriving by train down the Champlain and Mohawk valleys. And the oil that does not continue south by rail is being loaded onto barges and ships and carried south along the Hudson to refineries on the coast. 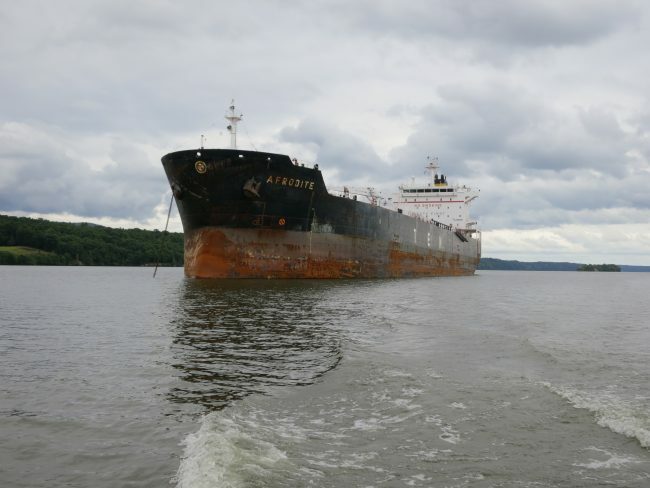 The risk of a crude oil spill to the Hudson – already a serious threat due to the surge in barge and train shipments of Bakken crude oil since 2012 – will rise even further if new anchorages are granted to facilitate the movement of more oil. And is the transport of more crude all we face if these anchorages are authorized? In other parts of the country, crude oil is being stored in vessels until prices rebound. Is that what we face here? Is that why so many anchorage locations are being requested? Or will the next request be a proportional increase in oil handling facilities in the Port of Albany to eliminate the current gridlock in the port and facilitate the movement of additional vessels? More oil on the Hudson equals more risk of spills. Despite good-faith efforts by the Coast Guard and the state Department of Environmental Conservation to better prepare for oil spill response, one thing is clear and undisputed: In the event of an oil spill, only a tiny fraction of oil is ever recovered from the river. 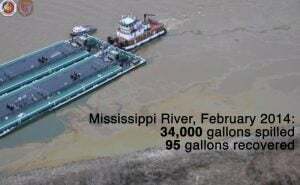 The photo at right shows how little oil was recovered after a Mississippi River oil spill. 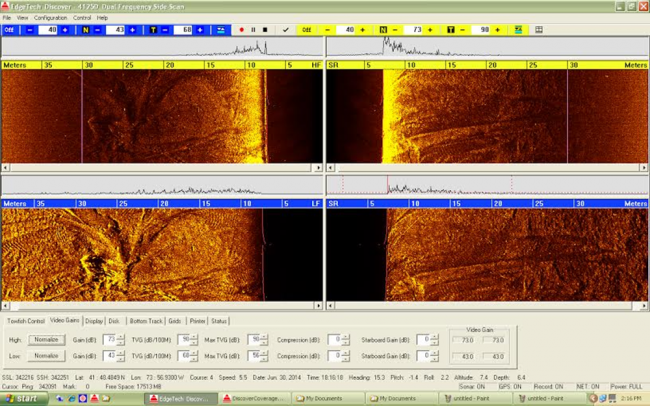 Riverkeeper is working to reduce the ever-expanding threat of a crude oil spill. A release of toxic Bakken oil could cause drastic, long-lasting damage to the Hudson. If industry succeeds in shipping heavy “tar sands” oil along the Hudson, the stakes are even higher. That oil sinks if spilled, and is essentially unrecoverable. “We appreciate that the Coast Guard has brought this request by industry to the public for comment. In my patrols, spanning over 15 years, we very rarely see even a half-dozen commercial vessels anchored between the George Washington Bridge and Albany. Now industry is asking for 43 berths in ten different areas of the Hudson River Estuary. What is driving this? If it could “support,” as industry has stated, an anticipated, enormous increase in crude oil transport south from Albany, we must oppose this anchorage request. We will oppose any effort to increase the volume of crude oil moving on the Hudson. 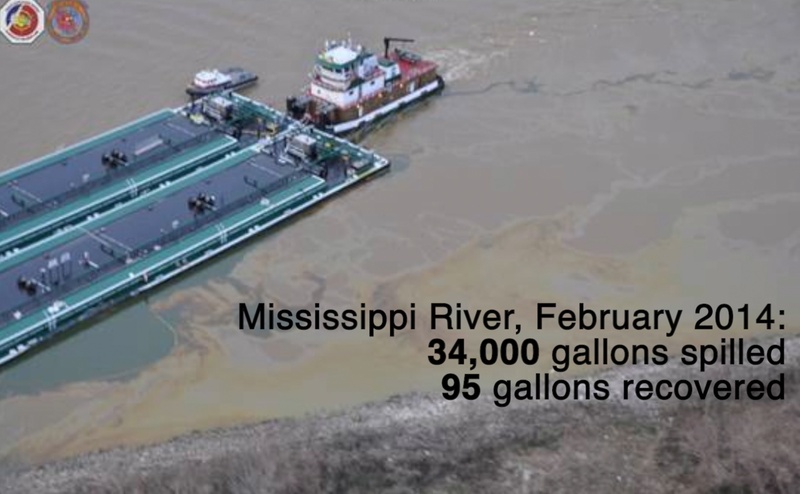 It has been demonstrated in numerous accidents already that crude oil, if spilled, cannot be recovered from a moving river. The Hudson River will not become Galveston. “The Hudson has given enough to industry: Rail lines run along both shorelines, cutting off marshes. Tributaries were dammed to power mills. Dredge and fill projects in the upper Hudson, to make the Port of Albany deeper, caused the loss of 60 percent of upriver shallow water habitat. Both the upper Hudson and the Mohawk River were dammed and re-engineered into canals for commerce. There are power cables, pipelines and power plants that use river water for cooling, killing countless billions of fish. Coal tar contamination persists at the manufactured gas terminals in many communities. And pollution persists from a long list of businesses, like Anaconda in Hastings, GM in Tarrytown, GE and its PCB poison, which made the Hudson the largest Superfund site in the nation. And countless, heavily contaminated shoreline areas remain in New York Harbor, dating back to the start the industrial revolution. The New York State Department of Health’s “advice about eating Hudson River fish” recommends that women under 50 and children under 15 should not eat any fish from the Hudson River. This is a terrible indictment of the historical impacts of industry on the Hudson River. 2. “Scarring” of the river bottom by anchors and anchor chains. Two endangered species, shortnose and Atlantic sturgeon, live in the Hudson. The river off Hyde Park, for example, may have the highest concentration of Atlantic sturgeon on the entire Eastern seaboard at spawning time in early summer. The area off Kingston, and “Sturgeon Point” across the way in Rhinecliff – is an important area for shortnose sturgeon. And both species of sturgeon overwinter near the proposed anchorages at Tompkins Cove and Montrose. As with the issue of light and noise pollution, which could vary from one area to another, the negative impacts to sturgeon may not be the same for all anchorage grounds. 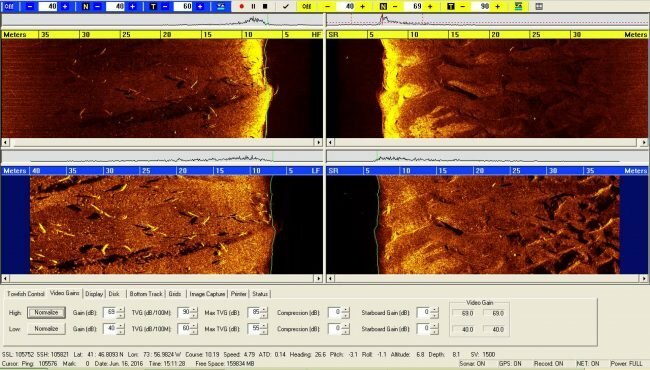 So it is clear that before ANY additional anchorage grounds are approved, research must determine to what degree anchor scarring damages sturgeon habitat. Click here to download a PDF of the letter from researchers Dewayne Fox, PhD, and John Madsen, PhD, to the Coast Guard, commenting on the potential impact that anchorages could have on Atlantic sturgeon riverine habitats. 3. Noise and light pollution. Members of some river communities have already spoken out against the bright lighting and engine noise that certain barges generate around the clock. At the Kingston hub, between Port Ewen and Rhinecliff, for example, the shorelines are sparsely developed, nighttimes are dark, peaceful and quiet. 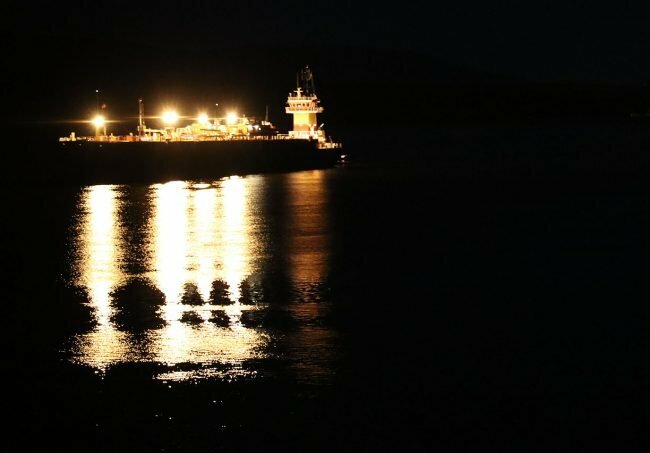 Crude oil barges began anchoring there around late 2012 using bright deck lighting, through the night, and the sound of their generators could be heard in homes near the shores. The three proposed anchorage grounds in the Kingston Hub (see map) will certainly meet with strong opposition over light and noise pollution. It remains to be seen whether other communities, near the other proposed anchorage grounds, will object to potential noise and light pollution. What is clear is that it will be up to public in communities near other anchorage grounds to make their feelings known to the Coast Guard. The only way the Coast Guard will factor the impact of light and noise pollution is if the public makes its opinion known during the comment period. We urge all local officials and concerned citizens to send their thoughts and concerns to the Coast Guard, so that the agency’s internal review leaves no risk unaddressed. consider the industry’s proposal in full. Submit Your Comments by December 6, 2016. Read the Coast Guard’s Advance notice of proposed rulemaking. Read Riverkeeper’s comments requesting extensive public meetings as represented by the Pace Environmental Law Clinic.